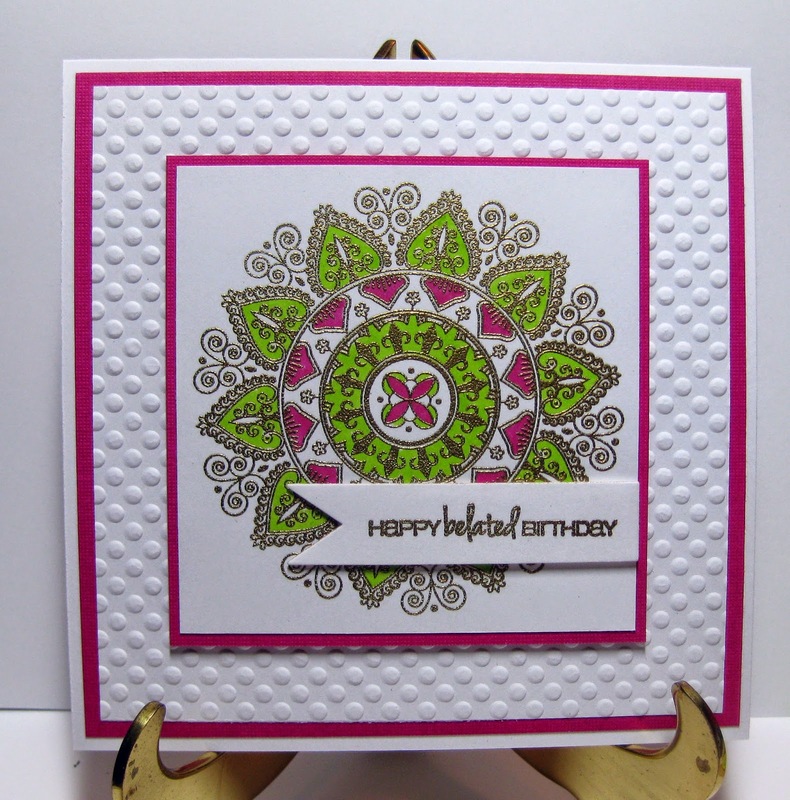 Sparkling Stampers: Happy Birthday Margaret! Well, I guess I wasn't so ready to get back to blogland on a regular basis just yet. I've been dealing with some medical issues for the last month and that has left me with little energy for much other than just getting through the day. However, over the past couple of days, I managed to put together a birthday card for my dear friend, Margaret, who, BTW, has become my advisor for all things in the supplement realm. I am not having much confidence in conventional medicine at this point. Those guys need lessons in listening and communicating! Ok, enough of that, on to the card. But first, let me share a photo of a cute little cardinal baby. There are actually 3 in the nest, but only one looked at the camera! 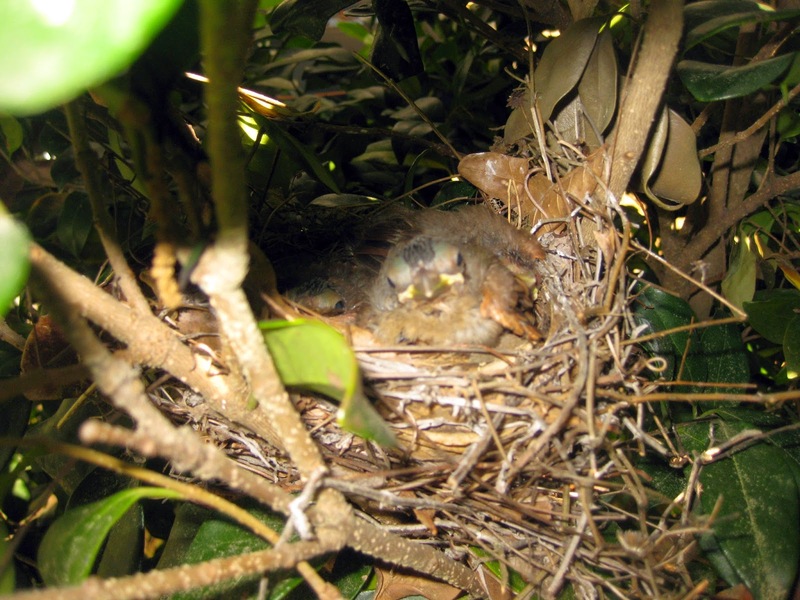 This little guy's parents made a nest right out our patio door in a ligustrum shrub. We watch them coming and going all day long, as we have a feeder visible from our kitchen, and a short diagonal flight from their nest. This is the first time we have had cardinal babies! You will notice that the sentiment says "belated". Well, that's because her BD is tomorrow but her card is still with me. Her presents have not arrived yet, so I procrastinated with the card since it will go in the package with the gifts. So technically, it's not late yet, and she will see it on time, but it won't be in her hands until later! I had expected her gifts to arrive earlier in the week and then I would expedite them to her, but that just didn't happen. It'll be okay because it's stamping stuff and that makes it worth the wait! Ha! Thanks for stopping by! I "intend" to be back soon! Gorgeous card. Love the medallion and your color choices. I'm sure your friend will love it too. So glad you joined us for the Sparkle N Sprinkle Creative Challenge this month. First of all your card is Gorgeous! Love the colors and the way your framed in the Medallion...second I am sorry your not feeling well, hope that you feel better soon, and last, those photos of the baby birds are so cool. Thanks for playing along with us over at Seize the Birthday and take care! Very pretty. Love the medallion and the embossing. I'm sure your friend will love it along with the stamping goodies. :) Thanks for joining us at Seize the Birthday.